Home of the original Mission-style burrito, still a giant in a neighborhood now filled with dozens of imitators. There’s no shortage of taquerias serving the Mission-style burrito in San Francisco but the simply-named La Taqueria is an undisputed favorite. 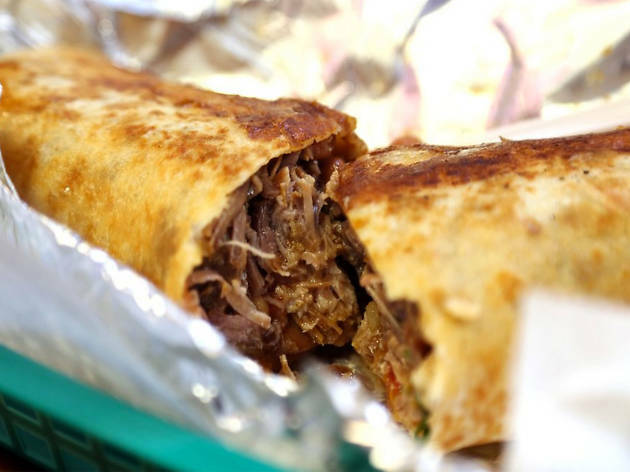 For under $10, this no-frills joint will serve you a giant foil-wrapped version filled with beans, cheese, salsa and meats ranging from carne and pollo asado to carnitas, chorizo and lengua (you won’t find any rice in the burritos here, a sore point for some burrito connoisseurs). As the name implies, La Taqueria also features tacos, quesadillas, aguas frescas and super-fresh guacamole. Call me a west coast noob, but this burrito was one of the best things I ate when I last went to San Francisco (and that's saying something). If you had told me that I would have loved eating a beef tongue burrito, I would have thought you were crazy, but it was incredible. The salsa is also amazingly fresh. If you're visiting San Francisco for a few days, definitely stop here for lunch! This cozy and perpetually-packed Mission restaurant serves what FiveThirtyEight deemed "the best burrito in America." On my visit, it didn't really live up the hype. 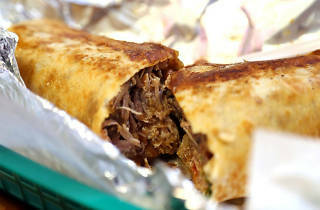 La Taqueria's tortilla-wrapped delicacy is a bit of a mushy mess. Everything taste like it was poured out of a can, reheated and then wrapped up in foil. Personally, I prefer a few crisp vegetables in my burrito, but if you need something that will slide down your throat and soak up some booze, you could certainly do worse.